Em… er… (cough) looking around sheepishly… Was that my outside voice? I may have mentioned before (8 or 9 times…) that this has been a late Spring. New York has the tremendous advantage of being in a spot with microclimates all over the place, between ocean and mountains, with hills and river valleys crisscrossing the area, so that Greenmarket has farmers from several different agricultural zones.You get to know which farmer will have the first tomatoes, and which one will still have tender lettuce in the heat of summer. Sometimes even a single farm can have two zones, which can be a huge advantage (if it doesn’t drive the farmer crazy, first…) And farmers now are learning methods of overwintering vegetables, so they get greens from plants that survived the winter, before the new plantings have a chance to grow. 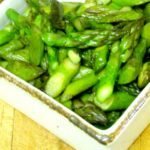 All this means that, the last few years, especially, we’ve been getting Spring vegetables in April… One particularly warm year, even in March. This year, though, it has been cold. I last (well, I certainly hope it was the last!) wore my winter coat a week ago! And I’ve been going to markets where they’re running out of the root vegetables that carried them through the winter… The cabbage is long gone. And we’ve been waiting impatiently. 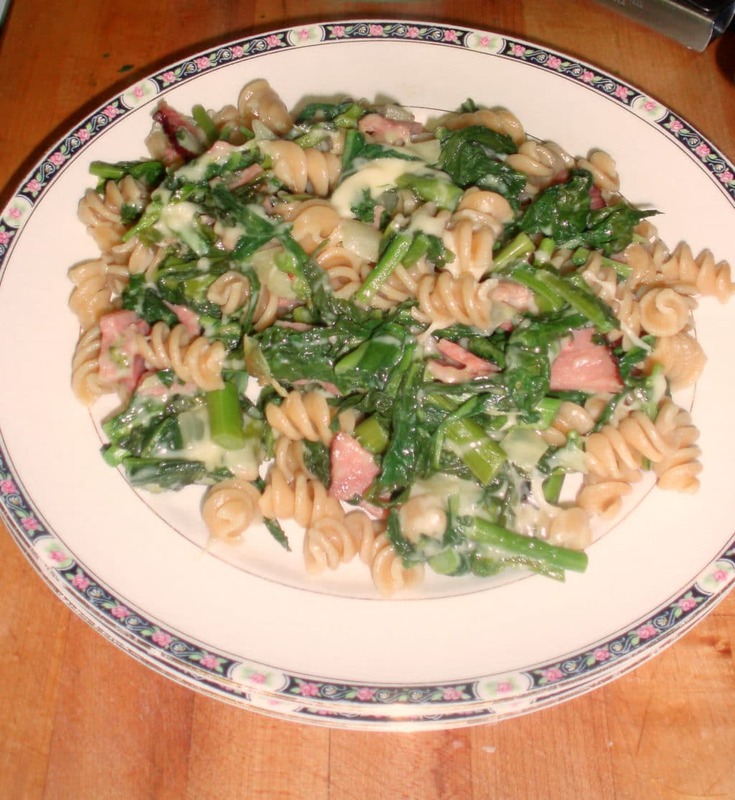 But last week – spinach! Baby collards! 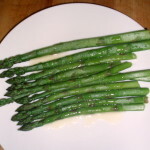 I confess – I didn’t do much with them – just sauteed them with a little olive oil and ate them up in their glory. 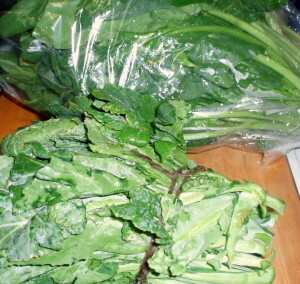 Collards, at this time of year, so tender they cook like spinach. 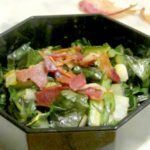 Spinach in – dare I say? – a salad. Pure, beautiful green loveliness. 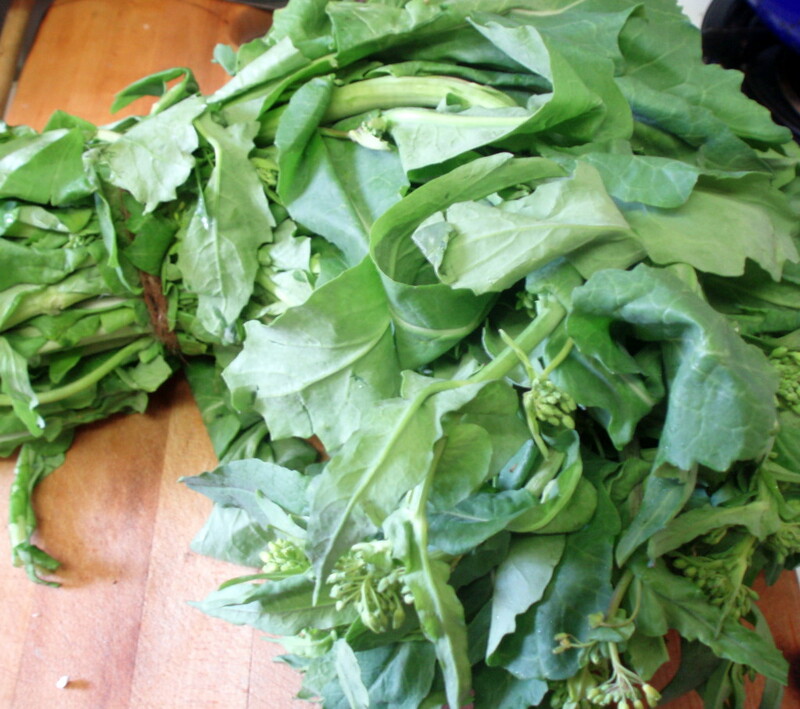 The second time I got to the market, I got broccoli rabe. I was past the first exuberance, but still wanted to feature it, and its fascinating, slightly bitter taste. What better than pasta? 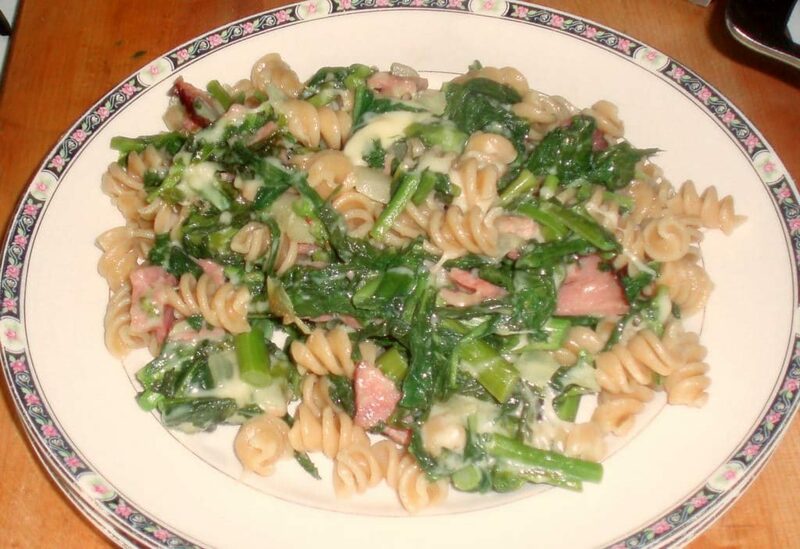 First, I cooked the rabe, using the basic method of cooking greens (to which I’ll refer frequently.) 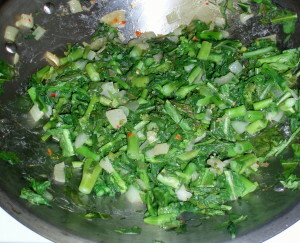 I started with a large onion, sauteed it in olive oil (a bit more than I would normally use) and added some chili-garlic sauce before adding the chopped, washed, still slightly damp greens. Meanwhile I put on a pot of water, and cooked whole wheat spirals. I eat only whole grains, as you may have noticed, and I prefer the texture of the whole wheat – but many of my friends prefer brown rice pasta, feeling that the wheat is just too chewy. (I must admit it did take a while for us to get used to it…) Either is an option. 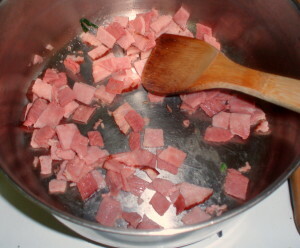 I drained the pasta into a strainer in the sink, and then used the same pot to heat cooked leftover ham, cut in small pieces. I wanted it to just brown a bit. 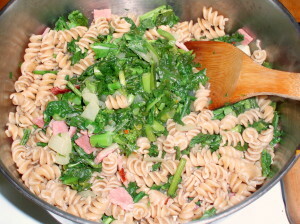 Then I added some of the cooked rabe, then the cooked pasta, more rabe (this to make it easier to mix them.) Stirred it all up together, over low heat, until completely mixed. Then I added some Jarlsberg cheese which I had cut in cubes, stirred it in, and covered the pot to let it melt. Let Rich in to set the table – and served. What could be easier? And oh, my, it was a good combination – gently bitter green rabe, salty savory ham, rich creamy cheese – and the pasta pulling it all together. Every forkful was a burst of flavor. And there was enough cooked rabe left over for me to put it in lentil soup for my lunch today. Perfect.